Good morning! It's a beautiful one here in Red Bulls Land. As we get ready for tonight's away match in LA LA Land, let's examine some RBNY stuff from the past week. Red Bulls defensive midfielder Teemu Tainio picked up a soft groin injury during the game against KC, and had to be subbed at halftime. Earlier in the week, his participation against The Galaxy was in doubt. It was confirmed yesterday that he has, in fact, not recovered from the injury and will not travel to the west coast. There was a bit of controversy this week with between RBNY coach Hans Backe and midfielder Dwayne DeRosario. Earlier in the week Mr. Backe stated that he expected DeRo would not participate with the Canadian National Team in this Summer's Gold Cup. A Day later, DeRo stated that playing in the Gold Cup was very much in his plans. Yesterday, Mr. Backe admitted he was mistaken and that DeRo would probably play in the Gold Cup. He also stated that he had given the Front Office a directive (back in February) not to sign any more players involved with National Teams. Sounds like much miscommunication within RBNY. Let's get that sorted, eh. With the build up to the titanic LA vs RBNY clash came several articles regarding Juan Pablo Angel facing his old club. In this one, the legendary Colombian lets it be known that it's good to be somewhere where he's wanted. I think everyone on this planet would agree with that. Yes, the Red bulls declined to renew JPA's contract and did, in fact, tell him last July. At that time, the Red Bulls, reportedly, entertained trade offers from, at least, two MLS clubs for JPA's services. We all know that didn't work out and JPA played out his contract, then was picked up by LA in the re-entry draft. "If I have my facts right, I think they told him midway through the year that they weren’t going to pick up his option. First of all, it’s not right to tell someone that and he still scored double-digit goals. It’s really bizarre but … I’m not surprised". What's really bizzare is that Magee, or anyone else who complained that JPA was mistreated by our club, doesn't know that what RBNY did is what's done at all football clubs in the world. A coach will say "look, son - you're no longer in our plans and you're free to find another club". A player's agent will hope that's done with plenty of time left on his client's contract, so he can find him another club. 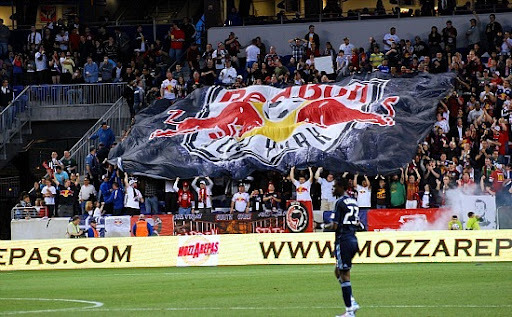 Should Red Bull NY have left JPA hanging, then told him after the season ended that his contract would not be renewed? I think that would NOT have been the right thing to do. Getting back to the forthcoming game: In the battle of the Designated Players, this article says it's no contest. Thierry Henry wins out over Becks. Lot's of Juan Agudelo stuff this week. First, he was on the cover of ESPN Deportes, with the headline announcing him as "The New Gem of MLS". Then, he was featured in this Fox Deportes interview, where he proclaims his love for Kim Kardashian. He was also featured in this Forbes article as one of the "Names You Need To Know". This past week, Agudelo took part in a RBNY soccer clinic for special needs children. Next week (Friday), he'll make an Adidas store appearance @the Bridgewater Commons Mall. Aging Brazilian superstar Ze Roberto has, once again, been linked to RBNY. An interesting article on the unexpected success of Luke Rodgers. A look back at last Sunday's "Meet The Team Day". This interesting article compares the tactics of former RBNY coach Juan Carlos "The Tinker Man" Osorio to those of Hans Backe. Finally, check out this great article, where Mike Petke, Bouna Coundoul and Chris Albright reflect on recent and past world events.